ONLINE PARENTING COACH: How do you suggest handling an unwanted friend? First let me say that my husband and I feel that finding your website and ordering your ebook have been heaven sent. We will have our sit down discussion with our two boys, P___ 21 and J___ 16. We have already started the poker face and requesting a task or chore when they request a privilege. It has shown great results already and I hope paved the way a bit into our family talk. J (16) was the one we were having anger issues with, P has always been very sweet...we realize now.... both were used to manipulate us. I would have never considered myself indulgent until I read your definition… oh boy am I! I know I will have more questions for you as we go along but I have one now that I could really use some suggestions on. J has a friend who has dropped out of school, no job and we feel not a good influence at all. He is from a broken family and just went to live with Dad, but that fell apart very quickly and he is back.... We thought our prayers were answered with him leaving the state. How do you suggest handling an unwanted friend? You may not be comfortable about your son's choice of friend. This may be because of his image, negative attitude, or serious behavior (e.g., alcohol use, drug use, truancy, violence, sexual behaviors, etc.). Check whether your concern about his friend is real and important. Do not attack your son's friend. Remember that criticizing his choice of friends is like a personal attack. Encourage reflective thinking by helping him think about his actions in advance and discussing immediate and long-term consequences of risky behavior. Encourage his independence by supporting decision-making based on principles and not other people. Get to know this friend if possible. Invite him into your home so you can talk and listen to him, and introduce yourself to his parents. Help your son understand the difference between image (expressions of youth culture) and identity (who he really is). If you believe your concerns are serious, talk to your son about his behavior and choices -- not the friend. Keep the lines of communication open and find out why this friend is so important to your son. 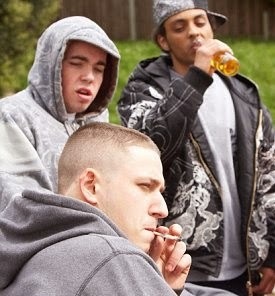 No matter what kind of peer influence your teen faces, he must learn how to balance the value of going along with the crowd (connection) against the importance of making principle-based decisions (independence). And you must ensure that your teen knows that he is loved and valued as an individual at home.